Registering your tools is the first step to ensure peace of mind that they will work just as hard as you do, and if they don’t, we have your back. In the event of any product related issues AEG can better service your warranty claims (as covered by the T&Cs associated to your purchases). Registering your tool allows us to contact you with important product notifications. This may provide you a record in case of product loss, fire or theft for insurance claims. From time to time, AEG have special Bonus offers where you can claim your bonus gift via online redemption. 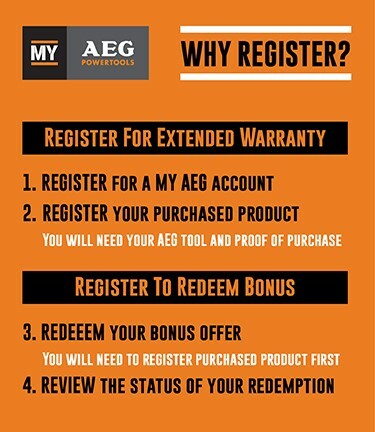 Bonus gifts can be claimed only through your my AEG account, upon registration of the purchased kit/tool. Registering your tool may help us continue to improve and design products that meet your needs. 2. After you have created your account we will send you an email to confirm and validate your email address. 3. Once your account is validated you will be able to log into your MY AEG account and register your tools. 4. If there is a bonus offer via online redemption associated with your registered product, you will be notified on-screen at time of registration. You'll need to know the model number and serial number for each tool. A valid proof of purchase is required for tool registration. For extended warranty*, tools must be registered online within 30 days from date of purchase.